Bump up the drama to create the most talked-about room in the house. Montecito concrete sink installed in a rustic powder room by Gabriele Pizzale. Without a shower or tub to steal the spotlight, the powder room vanity will be center stage—plus, it will likely provide the only storage in this small space. We’ve made each of our vanities to be traffic-stoppers and conversation starters—from the soulful detail of reclaimed barn wood in our Americana vanities, to the elegant second life of our upcycled wine barrel Bordeaux vanities. The average powder room measures 20 square feet—likely the smallest room in a home—a veritable pipsqueak! This makes it more feasible to pick out the most exquisite and exciting tile you can find—the graphic cement tile that you may have otherwise overlooked because of the price tag or the marble backsplash that is so beautiful it almost hurts. See: That pipsqueak just became prom queen. Maestro Sonata hammered copper sink in Brushed Nickel with vessel faucet by Graff. Since hand-washing will be the activity most frequently happening in your powder room, you may wish to select a sink that elevates the experience. A hammered copper sink, glamorous brushed nickel sink, or silky smooth concrete sink will do the trick. Or you may want to consider making a splash with a vessel sink that adds a sculptural element. We love the mixed metals trend permeating the kitchen and bath industry, but with only a faucet, towel bar, and toilet paper holder to consider, many choose a single fixture finish to unify the powder room. Whatever you decide, here again, is a chance to swing for the fences and select a special faucet and accessories. Further, pull the look together with a coordinating soap dish and canisters, tissue holder, and waste bin. Sculptural succulents complement the shape of this NativeStone concrete vessel sink. Use your half bath to display a small collection of artwork, inject life and purify the air with a plant or two (orchids, succulents or manicured boxwoods are favorites), wow guests with a unique mirror and flatter them by installing a pair of sconces on either side of a mirror rather than a single fixture overhead. 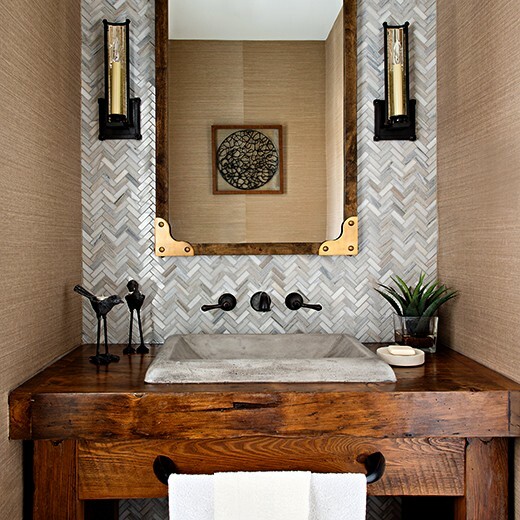 Find out how designer Jamie Banfield layers texture and color to create a powder room sensory show piece; learn more about creating fabulous powder rooms using reclaimed wood, integrated sinks, and cabin decor.